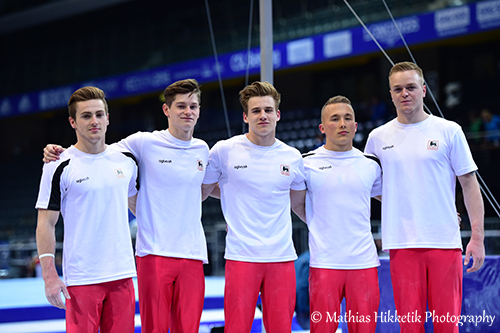 The Juniors kicked off the competition in Bern on Wednesday! Today, our Seniors were in action at the PostFinance Arena. And they performed really well on the big stage! If both teams failed to reach the top 8, two Juniors qualified for the all-around final, while Dennis Goosens will advance to the rings final! On Wednesday, Takumi Onoshima, Noah Kuavita, Jonas Delvael, Ward Claeys and Justin Pesesse competed in the last subdivision of the day. They were first up on pommel horse, a tricky event to start with. Onoshima had a fall but the other gymnasts delivered consistent routines. 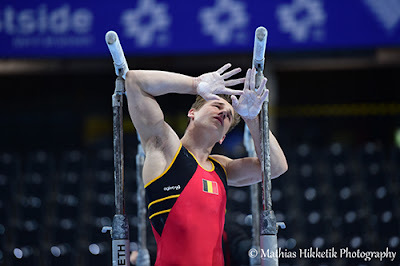 This was the only fall of the competition for Team Belgium, while Jonas Delvael had troubles on horizontal bar. Their best total was on vault, with 40.899. The team targeted a top 8 finish and they fell short, placing 9th with 236.694, less than 0.5 from the 8th position. Our gymnasts had a clean competition overall (except for the two mistakes) but a lack of difficulty prevented them to challenge the top teams. Great Britain won the gold medal in an impressive finish, winning their 5th team title in a row with their very last routine. Russia took silver and the host country, Switzerland, won the bronze medal in front of its homecrowd. On the individual side, Noah Kuavita and Takumi Onoshima both qualified for the all-around final that will take place on Friday night. Kuavita placed 16th in qualifications, while Onoshima placed 25th, but qualified for the final thanks to the two per country rule. 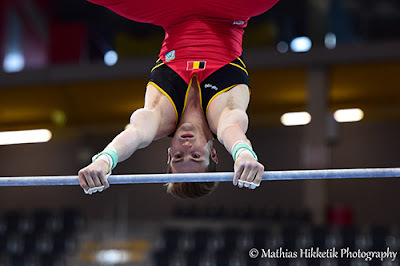 The Juniors failed to qualify for an individual final, but Kuavita is the first reserve on horizontal bar. This result is nevertheless encouraging for this young team. Performing in front of a big crowd can be intimidating but that's how it goes at big championships. It was the first time they ever took part in a European Championships and this experience will definitely help them for the future. On the Seniors' side, Jimmy Verbaeys, Luka van den Keybus, Bram Louwije, Siemon Volkaert and Dennis Goossens placed 9th too. With a 3 up 3 count format, no mistake is allowed to reach the top. Our boys had some mistakes today, especially on dismounts. 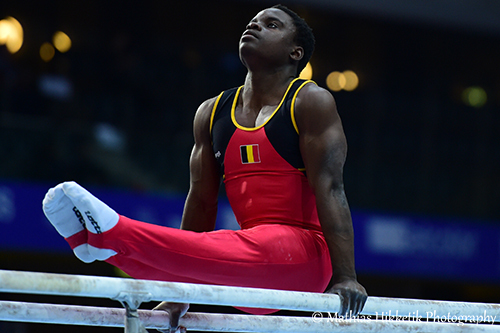 They started on vault where Luka and Jimmy showed strong performances (14.4 and 14.2 respectively). Siemon went out of the lines on his landing and got a 0.3 penalty (13.466). Jimmy then showed great skills on parallel bars, his best event, to score 14.550. Unfortunately, Luka was a bit short on his dismount (12.800), while Bram was good to secure 13.700. 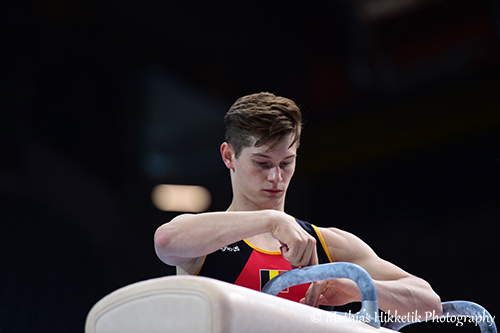 On horizontal bar, Bram was first up and he also experienced some troubles on his dismount (13.266), while Jimmy touched the bar with his feet (13.500). No mistake this time for Luka with a very good 14.133. Half way through the competition, our gymnasts were in 14th place. Siemon, Luka and Jimmy all had good scores on floor, scoring a total of 42.166. 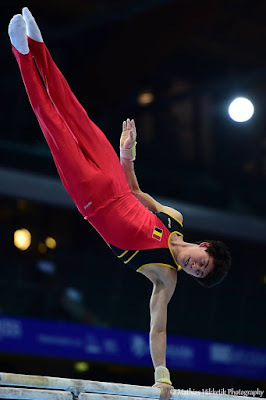 On pommel horse, Bram had the best score (14.466), followed by Siemon (14.100). Jimmy unfortunately had a mistake and scored 13.333. Our boys' last event were the rings. The level is sky high on this event as a lot of gymnasts are true specialists. 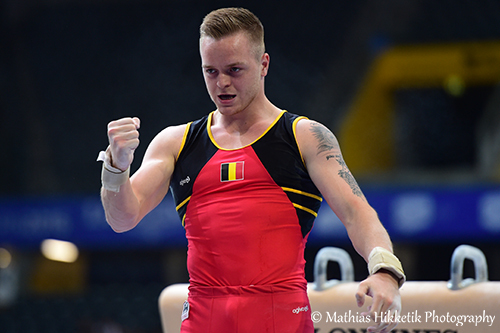 Our very own specialist, Dennis Goossens, scored a massive 15.366 and qualified for the rings final! 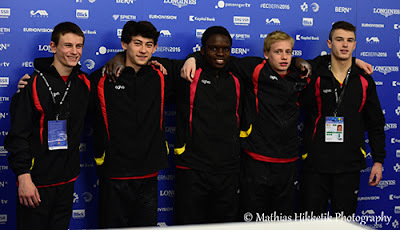 With 250.146, Team Belgium placed 9th, three points away from the last qualifying spot. 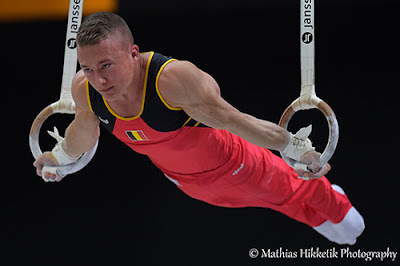 This means no team final for our guys, but Belgium's MAG team is getting better and better each year. Two years ago, in Sofia, they were 11th. Our gymnasts are proving once again they are improving and climbing the rankings fast, first at Worlds last year, then at the Test Event, and now here in Bern.